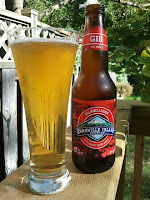 "Island Lager is brewed to our original recipe, which combines all-natural ingredients to produce its distinct hop flavour. The same clean, refreshing taste that put us on the map in ’84 still makes this one a local favourite." Pours like light golden straw and is almost clear from some angles. There is light carbonation and no head; a typical lager. Rather thick nose, and I'm struck by the amount of malt. There is a lot of bready sweetness that suggests a heftier ale, but also corn undertones that aren't encouraging. There may be some hops buried underneath, but I cannot detect them. Light bodied and creamily malted upfront, leading to a decently refreshing bite in the middle, and a muddled bitter/malt/sticky finish. I would compare it to Molson Export in feel and taste. It's been around for quite some time, but I found it unbalanced. I bought this as part of a four beer Granville tasting pack including; Island Lager, English Bay Pale Ale, Brockton IPA and Cyprus Honey Lager. This definitely rates near the bottom of the pack, just above the abysmal Honey Lager. I give it an C. Stick to their Brockton IPA (surprisingly hopped and accessible) and English Bay Pale Ale. Check out what other beer geeks think of this brew at Ratebeer and Beer Advocate.